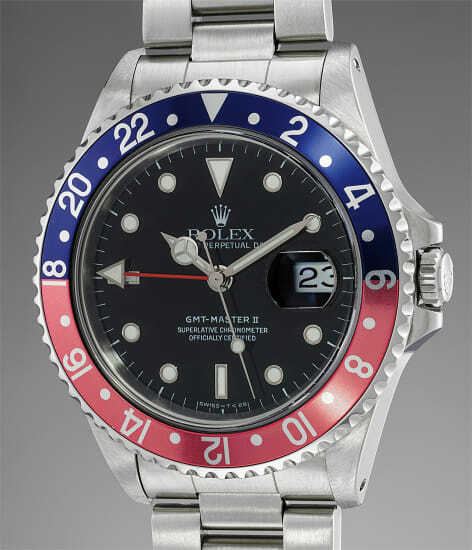 The Rolex GMT-Master II revolutionized the original GMT. The model was fitted with a new calibre that allowed the user to quickly adjust the hour hand forward or backwards in one hour jumps. When the hour is adjusted, the minute hand continues to run, which increases the efficiency of the watch and its accuracy. In 1983, the first GMT Master II was the reference 16760 aka “the Fat Lady” that was replaced in 1989 by the present reference 16710 sporting a slimmer case. The reference was available with three bezel variations: the Coke bezel (black and red), the All Black bezel, and the most sought after Pepsi, blue and red bezel, like the present example. Presented today in excellent overall condition, the watch comes complete with its box, original punched guarantee and product literature. This versatile watch with a strong and very recognizable design and color scheme is the perfect watch to be worn as a sports watch but will also add style to any formal wear.